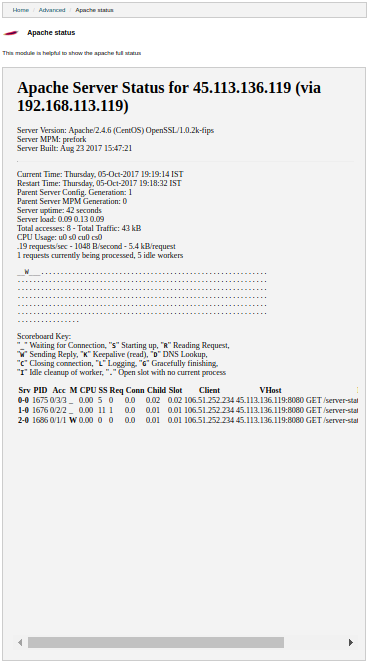 This Module is used to find out how well the server is performing. A good platform for troubleshooting a situation where your server is consuming all available resources (CPU or memory), and you wish to identify which requests or clients are causing the problem. This status should give you some idea what client, or what type of requests, are primarily responsible for your load problems. Often you will identify a particular web application that is misbehaving or a particular client that is attacking your site. It also shows the meaning and usage of all the abbreviations used to display the status which helps us to understand the situation better. You can also refresh the page every time seconds to see the updated statistics. The first part Apache status gives you good information such as Apache’s up time and when the service was last restarted. It also tells you how many workers are currently idle and servicing requests. The information present can help you determine if Apache recently restarted or if Apache cannot serve any more requests because it doesn’t have any idle workers. The second half of the status shows a text representation of what all the Apache workers are doing at a given moment. The key below it tells you what each letter stands for. This information can help you troubleshoot Apache when it is having trouble keeping up with traffic. For example, Apache is having trouble serving all the requests that are being made of it. If the Apache status had a bunch of “K”s listed (for requests that are kept alive), the KeepAlive variables in the httpd.conf could be tweaked. 1. The number of worker serving requests. 2. The number of idle workers. 3. The status of each worker, the number of requests that worker has performed and the total number of bytes served by the worker. 4. A total number of accesses and byte count served. 5. The time the server was started/restarted and the time it has been running for. 6. Averages giving the number of requests per second, the number of bytes served per second and the average number of bytes per request. 7. The current percentage CPU used by each worker and in total by Apache. 8. The current hosts and requests being processed. 1. we can balance the server resources and application memory usage. 2. By getting updated statistics it is possible to optimize the website as well as we can upgrade the hardware based on usage. So what is an Apache server? An Apache is a server that runs in the background under an appropriate operating system, where it supports, multi-tasking, and thus provides services to other applications that connect to it, such as client web browsers. And in Apache web server it has modules where it adds more function to its software such as MPM or mod_ssl for enabling SSL v3 and TLS support.